Rebecca R. – New Haven, CT. In November of 2003, I met the man I was going to marry. It was one of those things that you see in the movies – 2 people meet and it is love at first sigh. I know, it’s corny… but for me and my husband, it was true. We got married 2 years later and immediately wanted to start trying to have a baby. My husband was 38 and I was 31 – no one was getting any younger!! We tried for about a year and a half before thinking that maybe we might want to talk to someone. My husband was diagnosed with bilateral varicocele and was told that the condition could be contributing to our infertility problems. He decided to have surgery to correct it. We were told that it could be 6 months to a year before we would see any results from the surgery and neither one of us wanted to wait that long. In January of 2006, we decided to talk to my OB/GYN and we tried one round of Intra-Uterine insemination (IUI). That was unsuccessful, even with being on Clomid to help develop the eggs. In June of 2006, we went to the Yale Fertility Center and met with Dr. Taylor. He promised me that I would be pregnant in a year. He had a lot of success with In-Vitro Fertilization (IVF) and after all of our tests, he said that there should be no problem getting me pregnant. The first round of IVF, I did not produce enough eggs, so they converted the cycle to IUI – which…again, was unsuccessful. The 2nd round of IVF went better. I progressed normally and developed 15 eggs. They were able to retrieve 14 and 10 of those retrieved fertilized. On day 3, Dr. Taylor transferred 3 embryos. We originally received a positive result, but miscarried (early). My 3rd cycle, I developed 16 eggs, but only 12 were retrieved. Of the 12, they were only able to fertilize 10. On day 5, we transferred 2 blastocycsts. This cycle was the hardest. I over stimulated my ovaries, had to have pain medication after the transfer, the transfer was AWFUL and I almost asked to be knocked out. Needless to say, that cycle didn’t work. 4th and FINAL cycle … I wasn’t taking ANY chances I had done some reading and found that there was proven success with using acupuncture. I wanted to give it a try. It was our last shot, and I was holding nothing back. I started the acupuncture the week I started my first medication “Lupron”. Rich was wonderful. He put me right at ease and explained everything he was doing. As the dr’s visits (to the Fertility Clinic) went on, I went to see Rich 1-2 times / week. My stress level went down significantly. It was amazing!! I developed 11 eggs. Of the 11, 6 fertilized over night. 9 made it to transfer. The day of the transfer, I went to see Rich 1 hour before. My mom and I arrived with my green tea and listened to my music while Rich did his “magic” Then we went to the hospital. I told my dr that I wanted to (1) do the transfer on day 3 because originally… that worked! and (2) that I was transferring 4 embryos… no more, no less! Dr. Taylor still says to this day that it was the easiest transfer he has done in his years of performing IVF. My body was completely relaxed and it took less than 10 minutes. After the transfer, I went back to Rich for another treatment and then went home to rest for 3 1/2 days. 10 days later… I got the best news ever!!! After almost 4 years of trying, I was pregnant I was originally pregnant with twins, but lost 1st baby at 7 weeks. I delivered 10 days prior to my due date via cesarean section. My son was 6lbs 11.5 oz and 19 inches long when he was born and is the best thing that has ever happened to me!!! The first picture is of him (and me!) when he was 2 days old and the 2nd is one that was taken on August 19th, the day after his 8 month birthday. Mary – Guilford CT. A friend of mine told me to go see Rich because I was having difficulty sleeping because of hot flashes and lower back pain. I felt so much better after the third visit. I do not know how he did it but I am much more comfortable. I can sleep and the hot flashes have declined almost 90%. Mike – Hamden CT. I hurt my back playing baseball. I was taking all kinds of medication but nothing seemed to help. 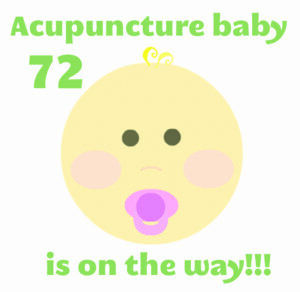 A friend of mine said I should go see Rich the acupuncturist. The guy worked on me for almost an hour and half. After the second treatment, I was able to go back to work and after the tenth treatment; I was able to play baseball again. Susan W. – Hamden CT. I suffer from endometriosis. I work at Health Net and one day when I was not feeling very well one my co-workers told me I should try acupuncture. I asked my manager “who does Health Net recommend” and my supervisor said “Richard Covello in Branford CT”, I am not kidding when I tell you I feel so much better and now I go for acupuncture once each week. Ann Marie – Madison CT. A friend of mine told me to make an appointment to see Rich . I waited about 2 months and when I finally could not take the pain, I gave him a call. I felt so much better, after the first treatment, I almost could not believe it. He put a needle in my leg and told me to rotate my arm. I did not even feel the needle but the pain in my shoulder felt much better almost immediately. Jamie – New Haven CT. I was diagnosed with breast Cancer and my whole world just stopped. The chemotherapy made me so sick. While waiting in my doctor’s office another patient told me that, I should go see Rich the Acupuncturist in Branford. She told me acupuncture helped her tremendously with the side effects of chemotherapy. Now I go for acupuncture after each course of chemotherapy. I feel so much better both physically and emotionally.